Maziar Yazdani, deputy head of Islamic Republic of Iran Railways, said the connection of Iran-Afghanistan railway networks would become operational soon. 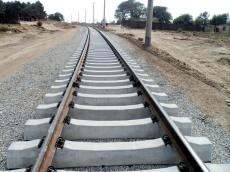 "Iran-Afghanistan railway networks through Khaf-Herat Railroad will be completed in the next few months," Yazdani said, according to Mehr news agency on August 3. Khaf-Herat Railroad (139 kilometers long) is part of Iran-Afghanistan rail corridor and has reportedly made 89 percent physical progress. The project started in the fiscal year of 2007-2008 and more than 2.96 trillion rials have gone into its construction so far. The official also said that the construction of a railway project that links the Iranian southern city of Khorramshahr with Basra Province in southern Iraq would begin this year. The railway is 47 kilometers long, of which Iran has already constructed 12 km from Khorramshahr to the border between Iran and Iraq. This leaves Iraq with the construction of 35 kilometers of the track. The Iraqi government has allocated about 1,100 billion rials to the project. Iran’s railway system is linked to railways of Central Asia, China and Russia and upon the completion of the 35-kilometer Shalamcheh-Basra railway, Iraq will be able to transfer goods and passengers to Russia and China and vice versa.